Suave, smart, supremely fit and witty; Sidharth Malhotra is the perfect choice for a film that goes by the name - A Gentleman, for the actor is indeed a thorough gentleman. I have seen some glimpses of his courteousness during the promotions of his upcoming film. When we travelled to Mehboob (which he jokingly referred to as his second home during promotions) for our interview, we noticed how the actor would patiently pose for images in between interactions. In fact, it was also nice to see him respectfully stand up, shake hands and greet veteran media persons, photographers. That's a rare sight in the busy world of race, glamour and competition that we live in. But, that's Sidharth Malhotra for you - real, honest and extremely chilled out! A Gentleman is the first film where you had the challenge of portraying two characters. What was that experience like? It was an interesting experience. This is not your usual double role film, jahan do bhai hain. Here, the entire film does not revolve around the double role element. Also, if you notice, the film is called 'A Gentleman' and not 'Two Gentleman' or something. That's for a reason (smiles). So, the film has a nice twist. How would you describe Gaurav and Rishi's respective worlds? Both the characters come from two completely different worlds. Gaurav is an NRI, who stays in Miami. He has set goals and dreams, someone who wants a 9 to 5 job, a perfect family. He buys a big house for them, gets a big van for the future kids and would also like to cook for his wife. The only thing he doesn't have is - a wife (laughs). On the other side, there is Rishi, who is more aggressive. He is stylish and likes to cruise around on his bike, with a leather jacket on. But inwardly, Rishi is a loner, and isn't too happy with his job. So, both of them have distinct characteristics. Personally, was there any kind of relatability with either Gaurav or Rishi? It's extremely difficult to relate, actually. Because Gaurav has some really typical and weird dreams. Honestly, I have never seen anybody who is so obsessed with getting married or settling down. You know, he is the kind of guy who will meet a girl for the first time, take her out and even propose to her on the same day. So, I honestly couldn't relate to that. As for Rishi, he is too aggressive for me. But nonetheless, what I like about the two characters is the fact that they have a good balance of humour and action. So, a lot of humour comes from Gaurav, while Rishi is all about action. Wasn't the film initially called Reload? What led to the change in title? That was actually a working title for an action film. During the process, we kept thinking about other options. However, by the last leg of shoot, we realised that since Gaurav (one of the characters played by him) is a very nice guy, we decided to call it - A Gentleman. Gaurav is a thorough gentleman. Later, the 'Risky' part was added for Rishi. 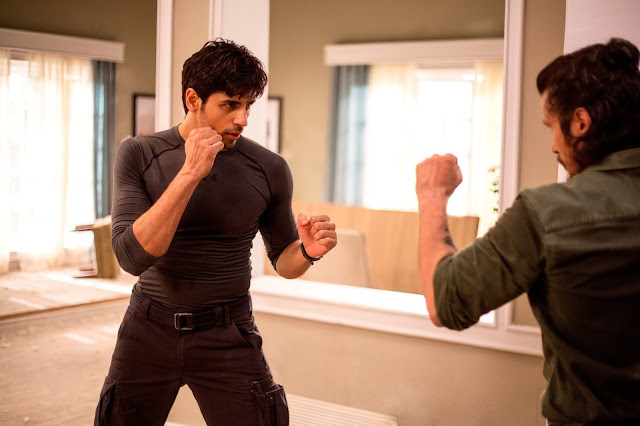 From the promos, one can notice that the action in this film is a breakaway from the kind of stuff you have done in the past, be it in Brothers or Ek Villain. You know, when it comes to making an action film, things get very difficult. Especially with keeping the budgets in place and ensuring the presentation is different. So, the action in this film is thrilling, with a lot of hand to hand action combat. It's all very real. There is no heavy CGI involved. We kept it real, but still got the same effect and kept it very slick and stylish. Are you keen on exploring the action genre a little more in the future, especially since a majority of the audience and fans have loved your work in this space? Personally, I love this (action) genre. I absolutely love the zone where there is a lot of thrill and action involved. I grew up watching action movies, and loved the James Bond series. Sadly, we don't make out and out stylized action films in India anymore. Even the kind of films that Bachchan sir (Amitabh Bachchan) or Dharmendraji used to do in the 70s - 80s. But, I feel fortunate that I came across this film and now that I have enjoyed it so much, I feel consciously, I will try to do a film that does this kind of action, maybe once in every two years. And if all goes well, which I am really hoping it does, we might even make this (A Gentleman) an interesting franchise. Hey Nick and Utkarsha, I feel Raj & DK are very unique film makers. Especially because of their background. They were engineers in America. And they often call themselves - an audience turned directors. They have always loved Hindi and films from down South. Then, they went on to become directors. They started off with 99, went on to experiment with the zombie space in Go Goa Gone and now, they have worked on A Gentleman. And I feel the uniqueness shows in their work. They don't do anything typical and have a fresh take. Their quirky, humorous writing is the biggest USP. In this film they have brilliantly mixed their quirky style with a dash of commercial entertainment. So, I have enjoyed working with them. A Gentleman pretty much has all the ingredients of a mainstream Hindi film. The right mix of comedy, emotion, drama, action, romance among others and plus, a double role angle for me as well. Hopefully, the audience will enjoy the two hour roller coaster ride. Aishwarya, I really enjoyed playing Rishi. The character is stylish and has got a heroic side to him. Also, there is a lot of action going on when he appears on screen (smiles). Dekha, do picturon mein kya hota hain (laughs). Bhabhi se sweetheart, aur yeh hain hindi picture ka kamaal (laughs). So, coming back to your question, Rita. During Brothers, the only time I got a chance to interact with Jacqueline was during promotions. And we hardly any scene together in the film. So, I got to know her really during the film. We shot the film in various locations including Mumbai, Miami, Hong Kong, Goa among others throughout the year. She is a fabulous co-star and doesn't need any ice breaker. She is always happy and doesn't allow the stress or burden of her previous work to get on to her. I have never seen her in a dull mood, and that helps. It's always nice to have someone positive around. I admire the fact that she is a self made person and works really hard. Was there the 'health' connection too, since both of you are a lot into fitness and experimenting with exercise routines? Oh yes! She is extremely fit and so, we would often bond over fitness. In fact, we would also bond over a lot of other activities. Like, during our Mumbai schedule, she used to talk a lot about horse-riding. One day, I told her ki meri bhi chutti hain, toh main bhi aa raha hoon. She actually called me up at 5:30 am and we were also joined by a friend. We went to Racecourse (Mahalaxmi) and enjoyed the experience of taking horse-riding lessons. Part II of this Interview will be out on Wednesday (Aug 23). Stay tuned!